I’ve talked before about how I am a fan of Sorcerers of the Magic Kingdom, particularly the collecting aspect of the game. I was one of those kids who played many a collectible card game in my day, more like rabidly collected the cards that I thought were amazingly cool from games like Magic and Star Wars and was afraid to play with them because they would get damaged, but you get the idea. Each card from Sorcerers of the Magic Kingdom has five main elements: the name, image, type of spell, type of Attack/Boost/Shield, and two lines of playful text that explain the story of the card. The stories cards can tell have always been fascinating to me. The imagery and ability of the cards, whether it is Sorcerers of the Magic Kingdom or Magic – The Gathering, is about as far as most players really delve into the story each presents. 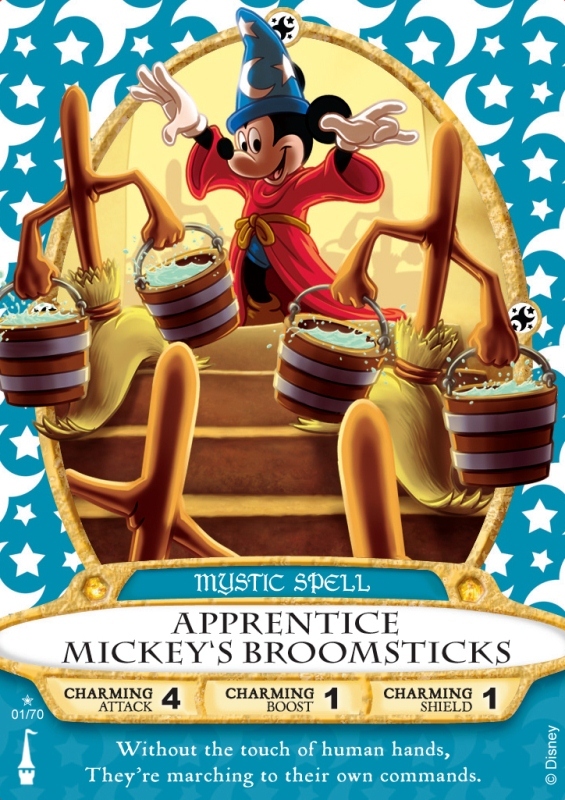 Sure the abilities are important, although in Sorcerers of the Magic Kingdom it seems to make very little difference to the game itself whether a guests uses a certain type of spell or ability type, such as Machine Spell or Princess Spell with an Energy Attack or Wishful Attack. However, I’m sure an analytically minded enthusiast could sit down and pound out rules for the game so it could be played at home in a matter of hours. Meanwhile, the pictures facilitate the progression of a story much in the same way the art of comic books do, but there is a lot to be gleamed from the other text found on the cards. For me, the story begins with the name of the card and the two lines of text, known as flavor (because they add a sense of time and place), is where the true story lies. Take one of my favorites as an example: Baloo’s Coconut Cascade, which reads, “Watch your step if you’re a klutz/Or you’ll be crowned with coconuts.” It has witty wordplay in the title, a nice rhyming couplet, and it tells you what you are in for with the card. The first set of cards, 70 in total, with 10 cards that have still not been made available to guests who did not partake in the testing of Sorcerers of the Magic Kingdom, pulled characters from all across the world of Disney animation. There are a smattering a villains included in the set, and I’d love to see a full set of villains to see villains smashing other villains in a baddie-royale rumble, but very few characters from Walt Disney World. With that in mind, I started playing with the idea of creating a set based on the adventures that take place inside the Magic Kingdom and Walt Disney World beyond. I shared a pair of these with followers on Twitter, and thought I’d share some more with you here. Below are some, not all, of the cards I’ve been messing around with. I didn’t try to come up with each card’s Attack/Boost/Shield numbers, but rather created the home story for the cards with a name, spell type, and the two lines of text. It’s all done in fun and games, but given a nice, new world to play in, I couldn't resist playing in it myself. I hope you have as much fun imagining these cards in your mind as I did putting them together! Beast’s Bellow – Warrior Spell – This bark is worse than its bite/But this roar will show your might. Big Al’s Guitar – Animal Spell – Pluck, pick, and strum away/The music can keep the dark at bay. Buddy Boil’s Hypnotic Wheel – Monster Spell – Reading minds is a wizard’s shtick/Master this and you’ll be pretty slick. Carnotaurus’ Chomp – Animal Spell - Wizards leave giant footsteps to follow/But don’t bite off more than they can swallow. Constance’s Cleaver Throw – Mystic Spell – It may be a ghastly sight/But this cleaver is a villain’s fright. Figment’s One Little Spark – Monster Spell – It’s a spark of inspiration/And soon you’ll be an imaginative sensation. I.B. Hearty’s Rockslide – Machine Spell – You may not conduct this train/But it can make the boulders rain. Little Orange Bird’s Orange Thoughts – Animal Spell – Be mindful of the Sunshine Tree/Or all your thoughts orange will be. Merida’s Will-O’-The-Wisp – Princess Spell – You’ll change your fate in no time flat/When these blue wisps show you where you’re at. Miss Tilly’s Water Eruption – Machine Spell – She may be stuck on Mount Mayday/But a watery blast will wash you away. Pierre’s Beak Assault – Hero Spell – If you think they’re just for singing/Ignoring these birds will leave your ears ringing. Shrunken Ned’s Shrunken Head Toss – Hero Spell – Three of his for one of yours/A cascade of heads will give you sores. The Caretaker’s Lantern – Hero Spell – When you stumble upon something scary/Shine your lantern to make ghosts merry. The Great Goofini’s Safety Net – Hero Spell – Safety first, make it nice and strong/Precautions make magic hum along. The Helmsman’s Swashbuckling Sword – Warrior Spell – If the high seas shake your bones/You’ll find this sword strikes better than stones. The Small World Dolls’ Smile – Toy Spell – It’s time you’re aware/A smile can scare away your nightmare. Timothy Mouse’s Magic Feather – Animal Spell – To fly you don’t need oversized ears/Just this totem to face your fears. Tinker Bell’s Pixie Dust – Fairy Spell – Inhaling it may make you sneeze/But flying high is the bee’s knees. Tom Sawyer’s Paintbrush – Hero Spell – Sling this brush at your foe/Paint them all from head to toe. Zurg’s Secret Weapon – Toy Spell – It may take a lot of batteries/So use it only in emergencies. They already have a Tinker Bell card!